This list may be out of date if you are reading an archived issue. For full information visit our Calendar page. Friday 31 March Great Western Society North West Branch. Birkenhead Joint Railway. Paul Wright. 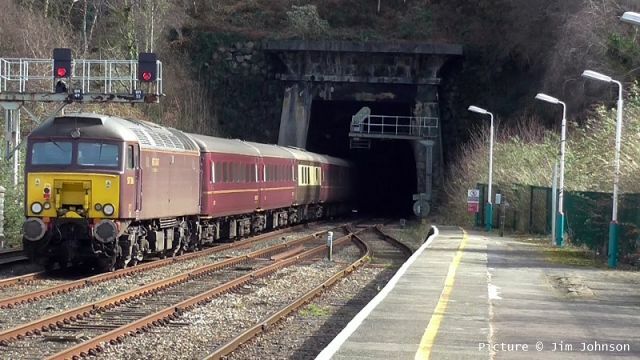 Tuesday 4 April North Wales Railway Circle Bangor to Hong Kong by Rail. Adam Fetherstonhaugh gives an account of his epic journey by rail from Bangor to Hong Kong via Beijing and then on to Vietnam and Cambodia. Wednesday 5 April RCTS Liverpool David Rapson. 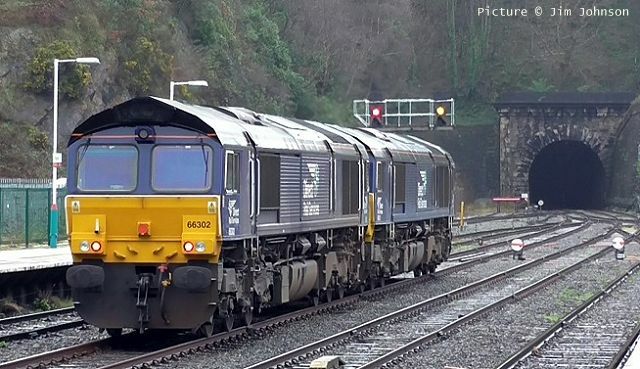 Railways - The Digital Effect David, who lives in Connah's Quay, has worked on the railways for many years spending a lot of his life in Control positions and now works for West Coast Railway Company. He is also a Branch member and for those who read Rail Express will be aware of his contributions. 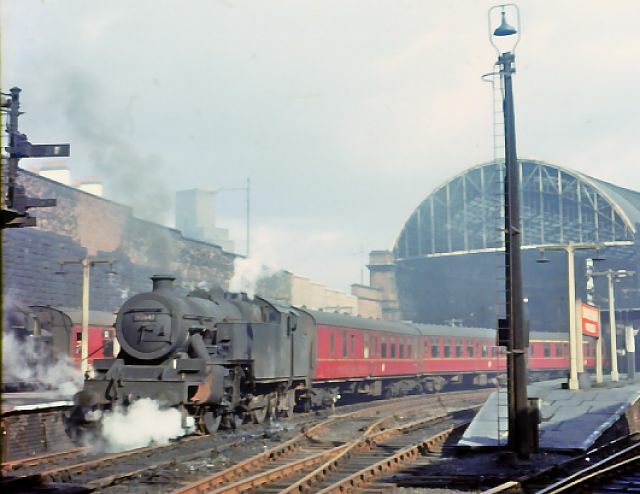 Friday 7 April Clwyd Railway Circle Railways of North Cheshire in Early BR Days Being a Manchester lad, Russell Hatt was able to capture the busy scenes around his home area. 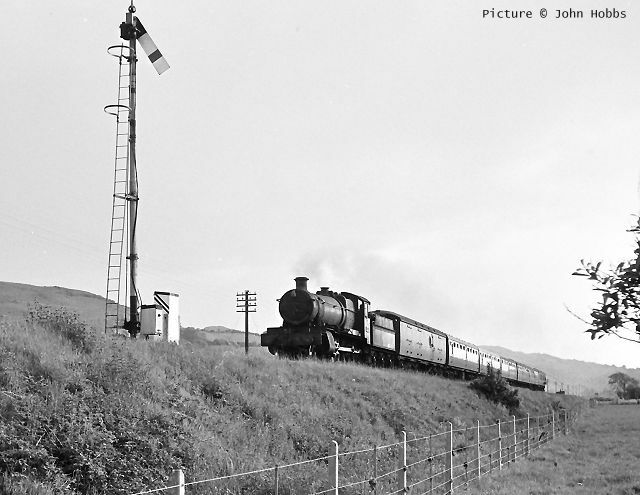 Wednesday 12 April Welsh Highland Railway North Wales Group Norman Kneale, Renowned railway photographer. 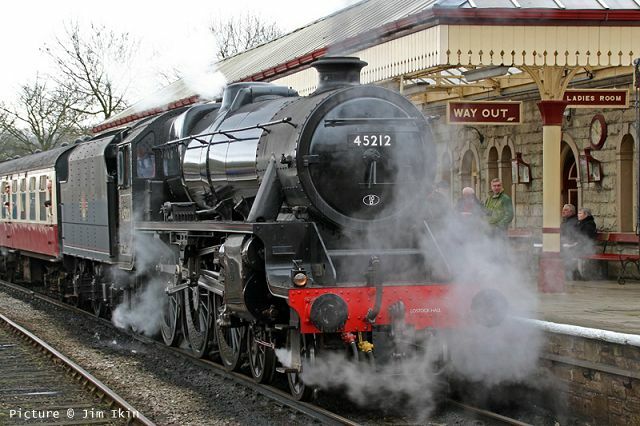 Thursday 13 April Llandudno & Conwy Valley Railway Society Barry Wynne's Steam Odyssey. 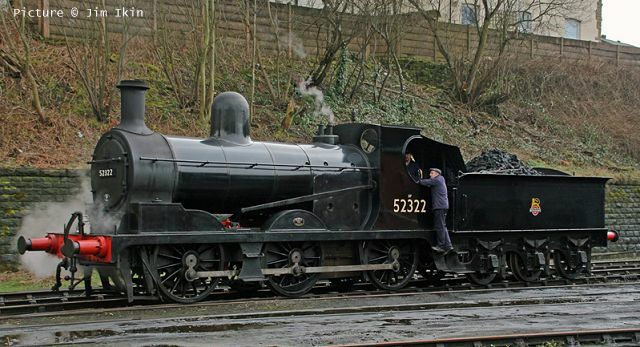 Monday 24 April RCTS Chester George Jones : Onwards to Corwen.George lives in Wrexham and for many years has been an important publicist for the Llangollen Railway and certain of its locomotives. He will cover the railway’s reinvigoration of the line to Corwen and look at its future prospects. Friday 28 April Great Western Society North West Branch. The L&Y in BR days. Noel Coates. 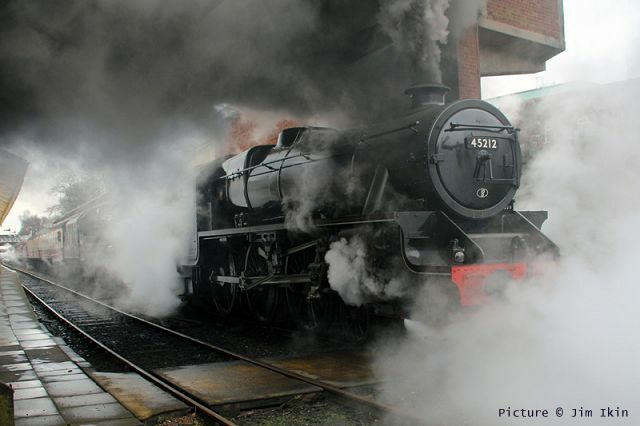 Tuesday 2 May North Wales Railway Circle AGM and Annual Photographic Competition. 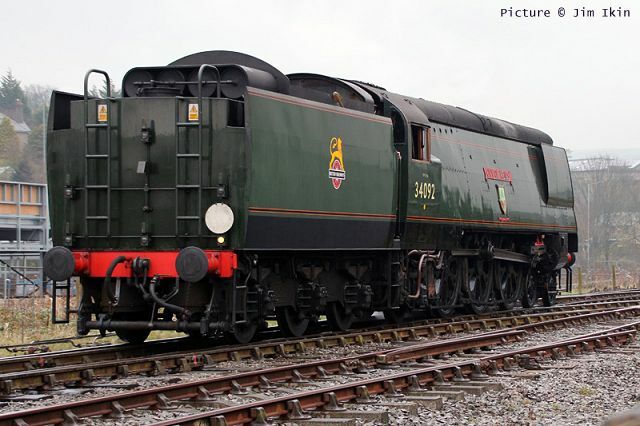 The Annual General Meeting of The North Wales Railway Circle will be followed by the annual photographic competition. Members are invited to submit their work in three categories, prints, slides and video. Video to be kept reasonably short, approx. 5 mins. In line with Circle rules all work should have been taken in the last 12 months. 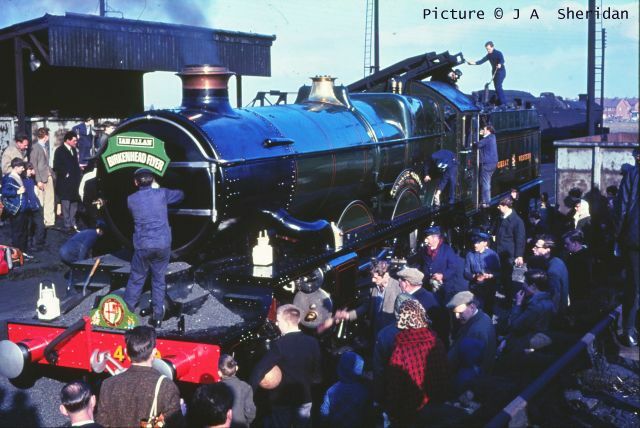 Wednesday 10 May Welsh Highland Railway North Wales Group Group’s AGM + John Ellis Williams - The Continuing Story. 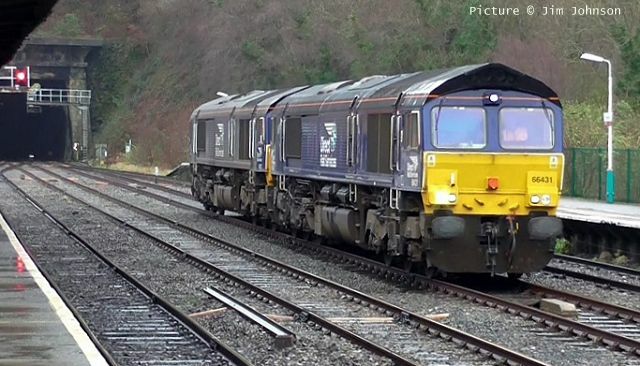 67 014 passes Penmaenmawr on 15 March with the 09:50 Manchester - Holyhead. Picture by Tim Rogers. De-fuelling of Wylfa power station continues apace. 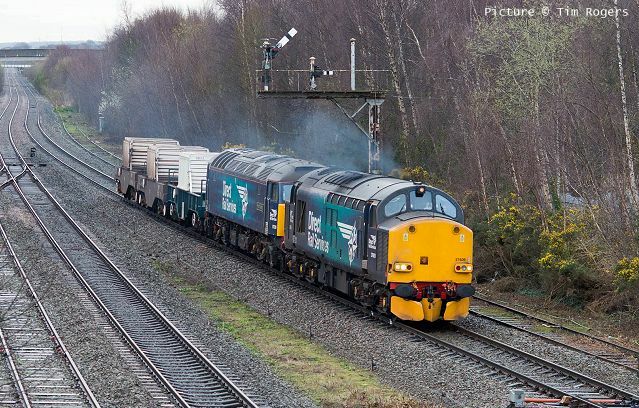 Above, 37 259 and 66 423 pass Sandycroft with 13 March's Valley - Crewe train comprised of one FNA flask carrier, 550051. Picture by Tim Rogers. There's certainly some variety of motive power on these trains: On 15 March 66 302 and Northern Belle-liveried 57 305 Northern Princess appeared with FNA wagon 550030 on train 6K41 14:58 Valley Nuclear Electric to Crewe Coal Sidings (DRS), only three minutes early on this occasion (Tim Rogers). The scene is Shotton Low Level station, with its 'Do not alight here' signs on the trackbed on the trackbed of the former slow line. Holywell Junction on 17 March: 37 609 and 57 310 Pride of Cumbria pass eastbound to Crewe with FNA wagons 11 70 9229 003-2, 550060 and 550042 (Tim Rogers). 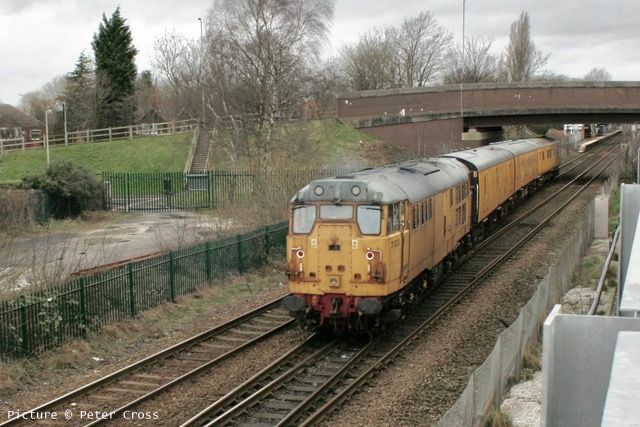 17 March's flask train returned to Crewe minus one of its wagons, which had developed wheel-flats en route to Valley. 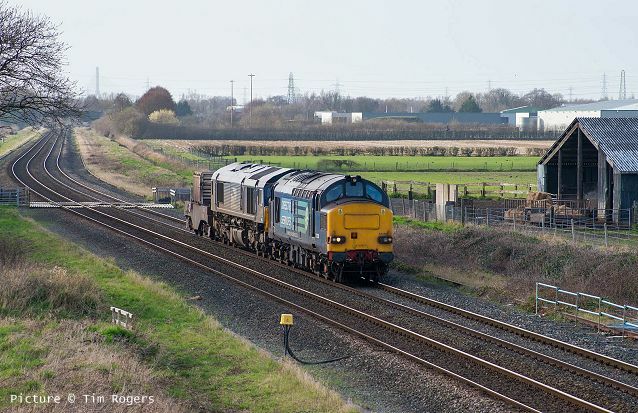 Saturday 18 March saw 66 431 and 66 302 working light engines Crewe-Valley, as 0Z41, to pick up the cripple, and return, at reduced maximum speed of 40 mph, as 7D41. 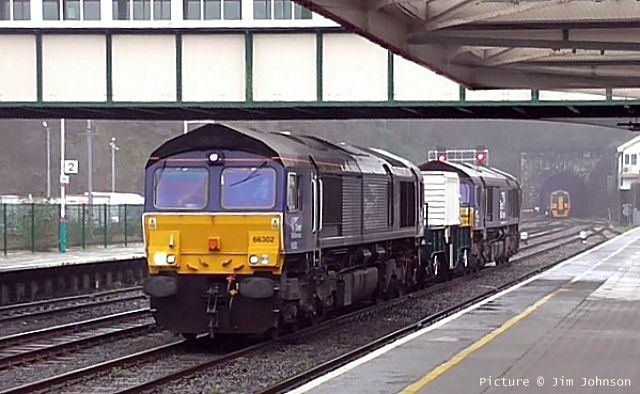 Above, 0Z41 at walking pace through the Down Main at Bangor, 66 431 leading, the starter still being at red. This was at 09:12, 34 minutes early. Picture by Jim Johnson. The signal turned to yellow, then green, just before the train was forced to stop (Jim Johnson). The return, 7D41 in top & tail mode, running through at 12:35, 5 minutes down, 66 302 leading. 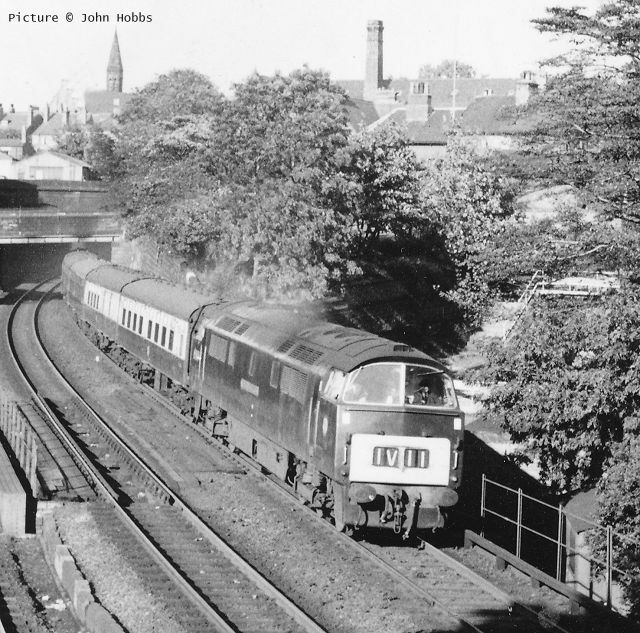 158 824, 1D12 09:10 Birmingham International - Holyhead is disappearing into Belmont Tunnel (Jim Johnson). Passing Beeches Farm (Bob Greenhalgh). 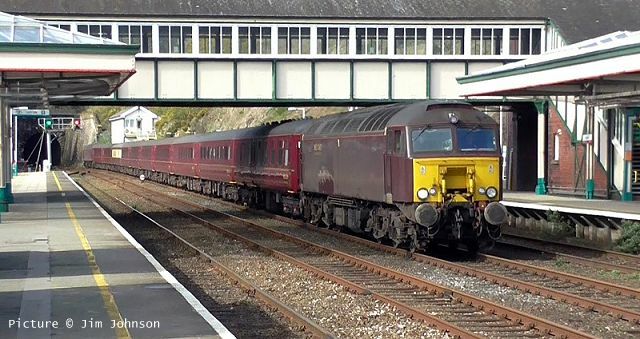 On 15 March an excursion from Llandudno to Edinburgh was worked top-and-tail by West Coast Railways locos 57 313 and 57 316, two locos which, some time ago, worked for Arriva Trains Wales. The schedule required a very early start from Llandudno and a very late arrival on return, but we can bring you pictures of the empty-stock workings on the days either side. 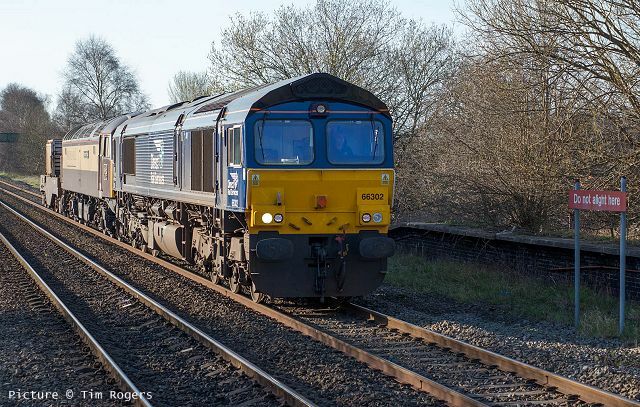 Above, on 14 March Tim Rogers captured the train, 11:23 Carnforth - Llandudno, at Winwick Junction on the way from West Coast's depot at Carnforth. ... and 57 316 on the tail.This was the return ECS of the previous day's Llandudno-Edinburgh excursion. As promised, Here are some pictures taken in 1967, received in response to our feature on the 'Along Birkenhead Lines' Gala at Llangollen. 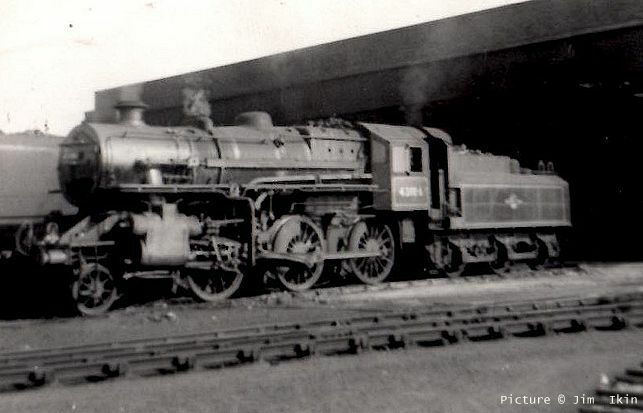 Standard class 5 no. 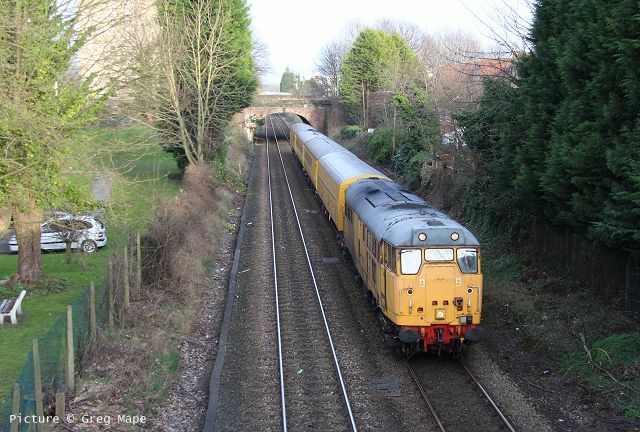 73026 departs Chester General with the Birkenhead section of the 'Zulu' (Peter Neve). 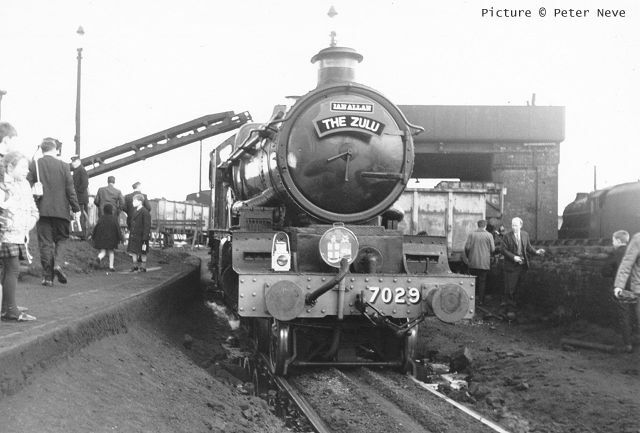 7029 Clun Castle, having reversed on the triangle at Chester, is serviced at Chester (6A) Motive Power Depot. 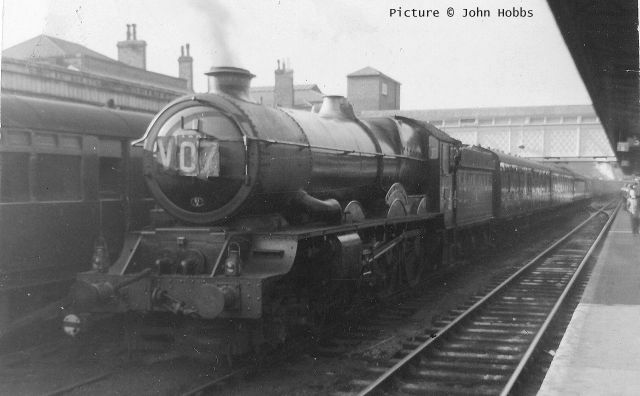 ... and 4079 from the 'Birkenhead Flyer.' The headboards stayed with the 'Castles' - the 'standards' carried small excursion boards. A bumper collection of John Hobbs views from half a century ago. 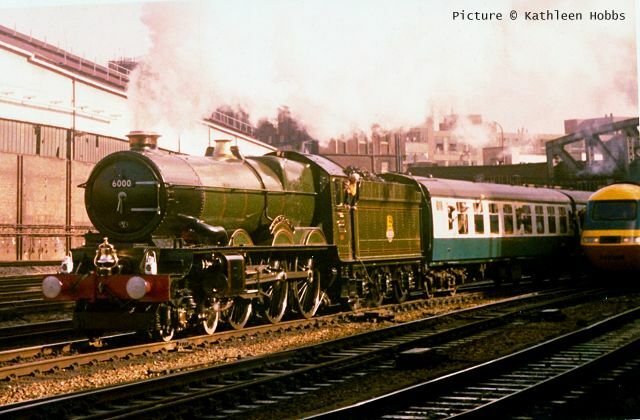 Above, 6001 King Edward VII stands at Wolverhampton (Low level) with the restaurant car portion of a train from the north bound for Paddington; probably 26 October 1961. 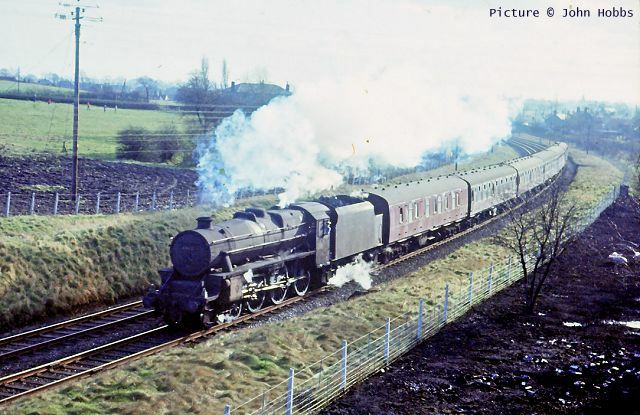 44831 near Rhosddu Colliery, close to the top of Gresford Bank with the 09.10 Paddington to Birkenhead (Woodside) on 4th February 1967. 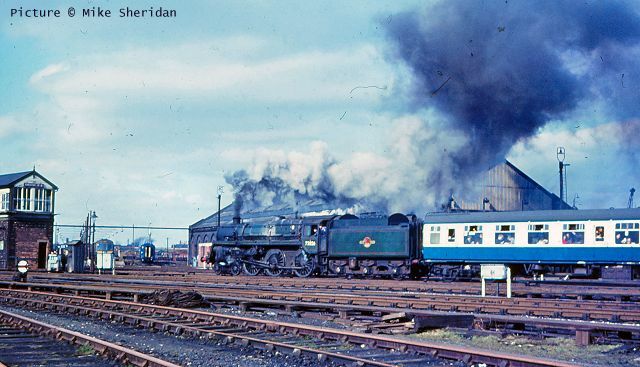 2-6-4T 42647 at Birkenhead (Woodside) on 26 February 1967, awaiting departure with a Paddington train. 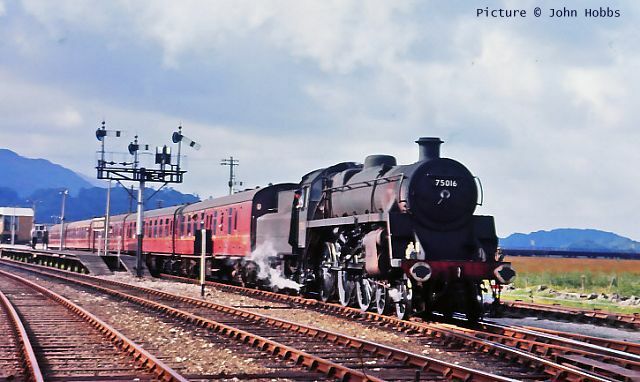 75016 at Dovey Junction on 3 September 1966; draws forward the Pwllheli portion of the "Cambrian Coast Express"; ready to attach to the Aberystwyth section. 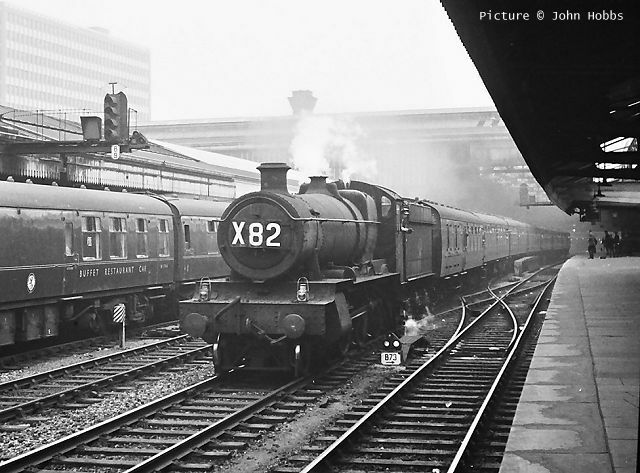 6861 Crynant Grange passes through Birmingham Snow Hill with a football special to The Hawthorns, possibly from Oxford, on 7 August 1965. 7822 Foxcote Manor approaches Bow Street on the 18.05 Aberystwyth to Shrewsbury with through vehicles for York, 8 June 1965. 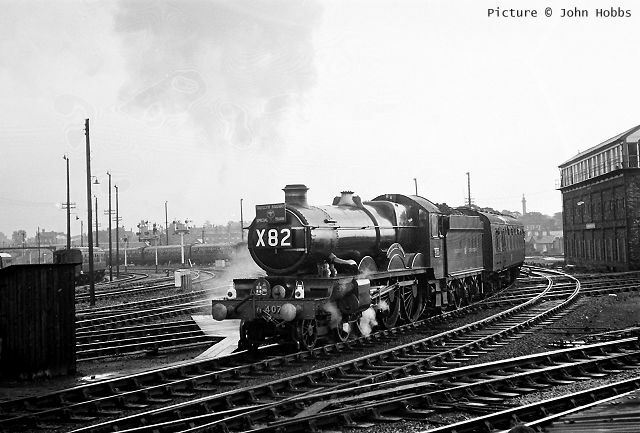 7908 Henshall Hall runs into Birmingham (Snow Hill) on 21 August 1965, with a train from the Cambrian Coast. 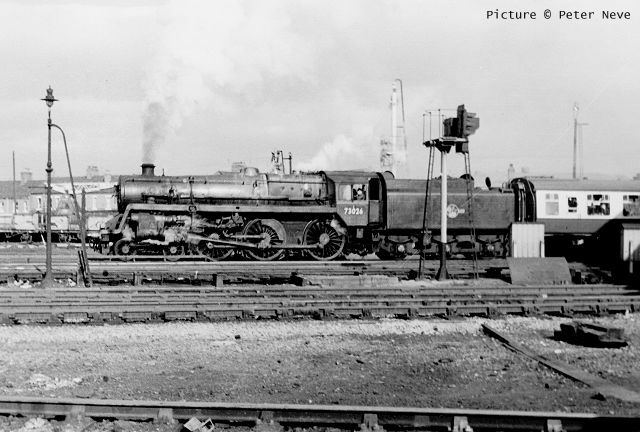 4079 Pendennis Castle arrives at Shrewsbury on 25 September 1965, with the annual Talyllyn Railway Society Special. 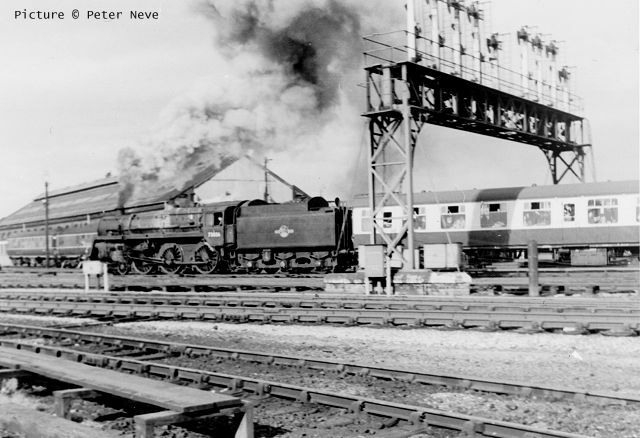 D1036 Western Emperor leaves Chester and crosses the canal, on the 8 September 1963. 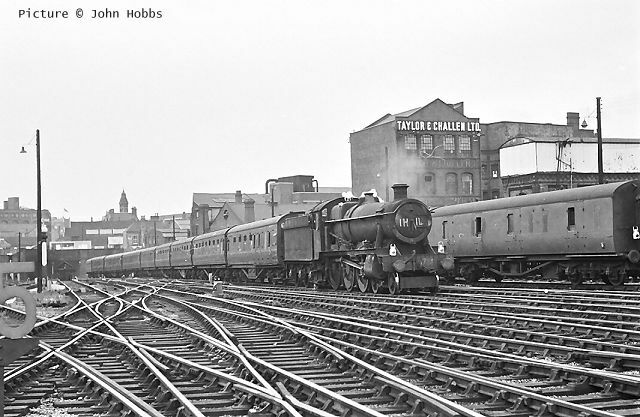 5042 Winchester Castle stands in the GWR bay at Chester (General) with the 5.37 pm Birkenhead (Woodside) to Shrewsbury on 25 May 1964. 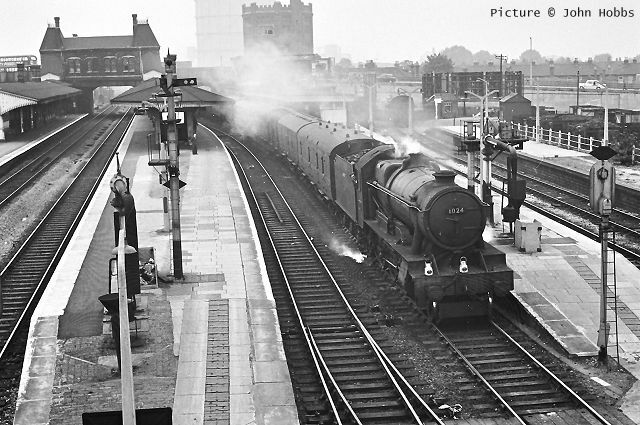 1024 County of Pembroke runs through Southall on 21 September 1963 with an "up" parcels for Paddington. Plenty of steam infrastructure in this view with water columns, backing signals etc. 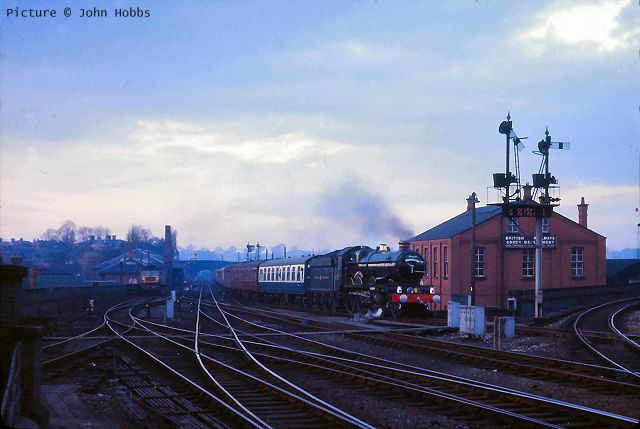 4079 Pendennis Castle passes Crewe Junction, Shrewsbury with the return "Birkenhead Flyer", just catching the remaining light from the sunset, on Saturday 4 March 1967; there was still steam the following day with 7029 but after that it was bleak. 6000 King George V leaves Paddington with a 'Paddington 125' Anniversary Special on 1 March 1979. Photo by Kathleen Hobbs. 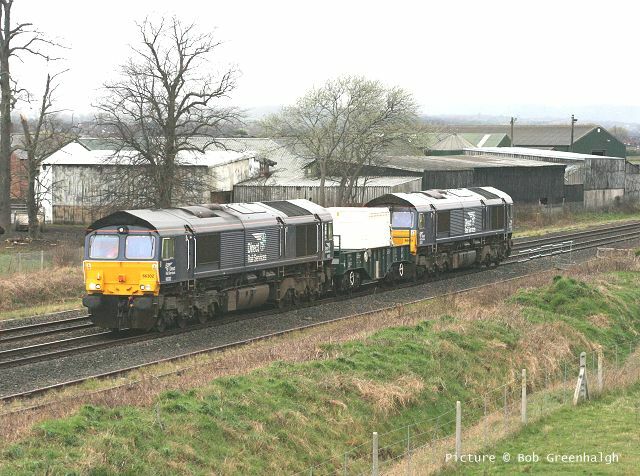 A good place to photograph freight trains is Winwick Junction, north of Warrington Bank Quay. 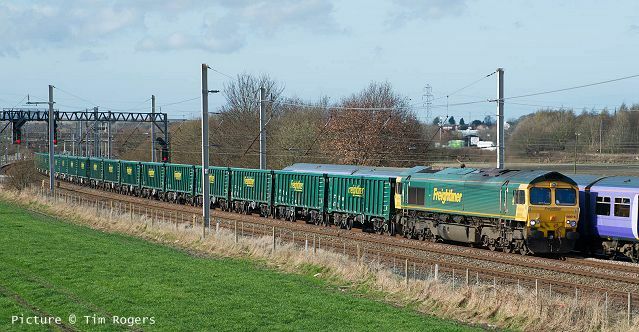 Above, on 14 March, Tim Rogers photographed 66 616 passing with a train of Freightliner's new box wagons as 6H51 09:35 Hardendale Quarry (Shap) to Tunstead Sidings. Apparently this service takes stone from Tunstead Quarry to Hardendale, in order that the Tata Steelworks in South Wales can be supplied with the correct specification of limestone. 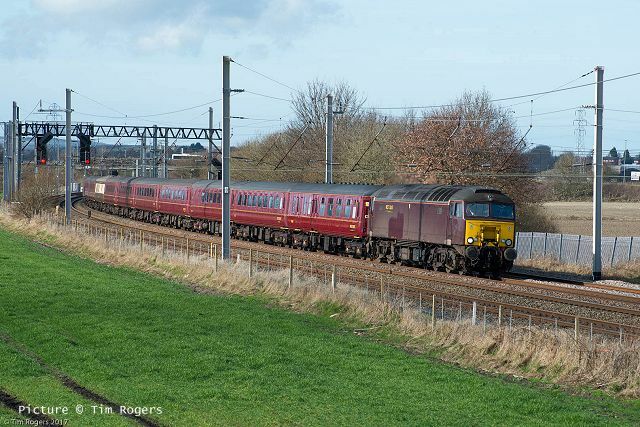 On the same day, this is 70 015 on 4S44 12:13 Daventry to Coatbridge intermodal (Tim Rogers). 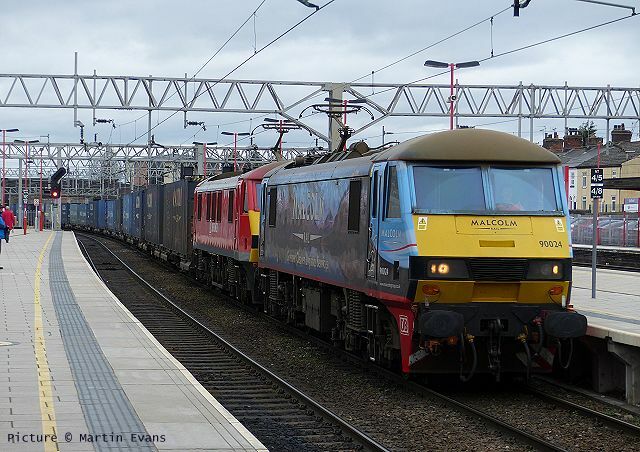 At Stafford on 16 March, Martin Evans took this picture of DB Cargo 90 024 and 90 040 at 13:20 on a Coatbridge to Daventry train for Malcolm Logistics; 90 040 has been given a special livery to celebrate the DB-Malcolm partnership. 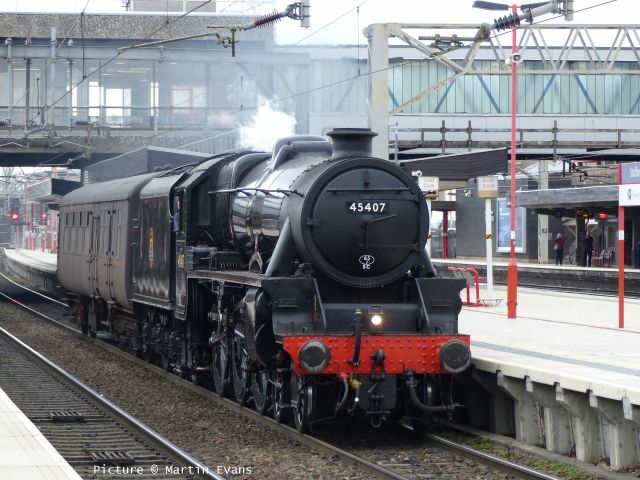 Martin Evans also photographed 'Black 5' 45407 passing Stafford with its support coach from Castleton (East Lancs Railway) to West Coast Railways depot at Southall. 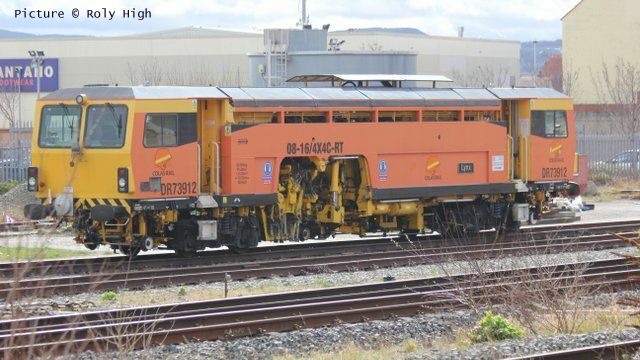 Colas Rail's Tamper DR 73912 Lynx stabled in Rhyl Engineers' siding, which seems to be its regular haunt (Roly High). 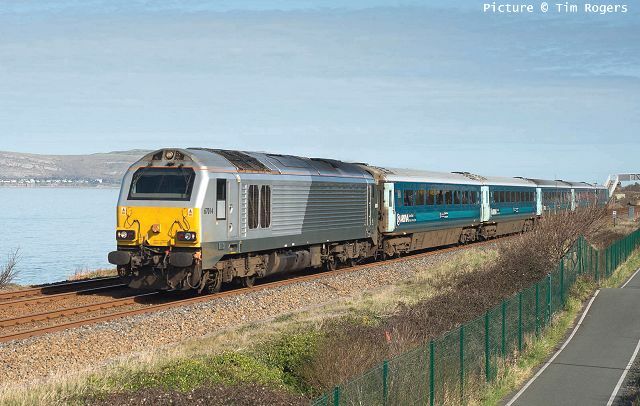 The Class 31 loco is now a rare sight on the national network: the only Network Rail machine still in traffic is 31 233 which has recently been working the Ultrasonic Test Train. 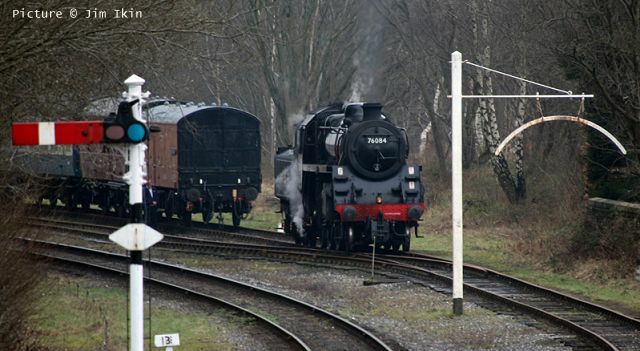 From the new upper deck car park at Hazel Grove, Peter Cross photographed the veteran propelling from the Hope Valley line towards Stockport. 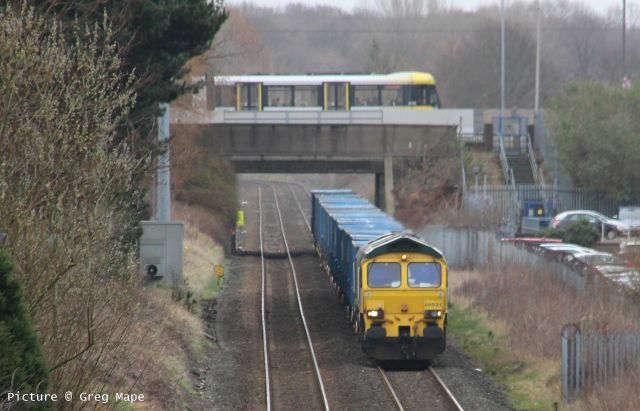 Baguley between Stockport and Altrincham on 13 March (Greg Mape). Note the former car-carrier behind the loco. 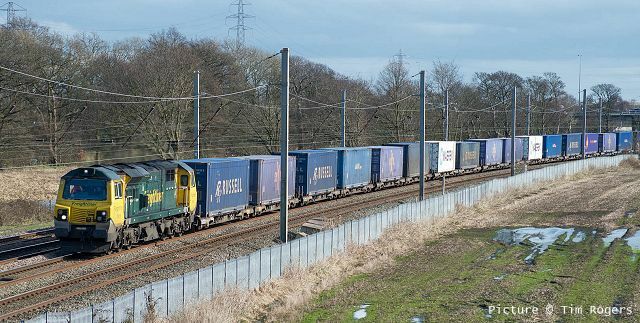 Baguley on 8 March, with 66 531 on a Bredbury to Runcorn 'binliner' and a Metrolink tram on the Airport line (Greg Mape). Eleven Welsh Narrow Gauge railways have shown a commitment to excellence in customer service by launching a training programme for their staff and volunteers. 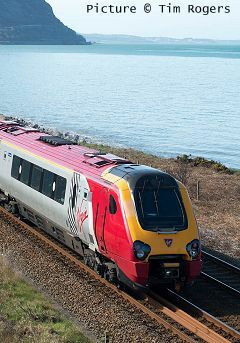 Grant funding from the UK Government Department for Transport’s Heritage and Community Rail Tourism Innovation Competition has enabled the Great Little Trains of Wales to develop the “Service with Spirit” programme. The programme was designed by the railways in collaboration and led by professional customer service training coach Amy Kirkland of Kirkland Training. This bespoke course has been specifically tailored to the needs of the heritage railway industry. Representatives from the Great Little Trains attended a one day workshop which covered a wide range of aspects, including championing passengers, providing good first impressions and making a lasting impression on visitors. After the training, representatives each received a toolkit to enable them to deliver the same type of training to fellow staff and volunteers within their own individual railway. In 2016, the Great Little Trains of Wales secured a £67,000 grant from the UK Government Department for Transport’s Heritage and Community Rail Tourism Innovation Competition. The grant enabled the group to publish a new guidebook called Big Train meets Little Train and accompanying website bigtrainlittletrain.com encouraging visitors to visit the "Great Little Trains of Wales" and many other Welsh attractions by public transport, as well as enabling the development of the Service with Spirit programme. 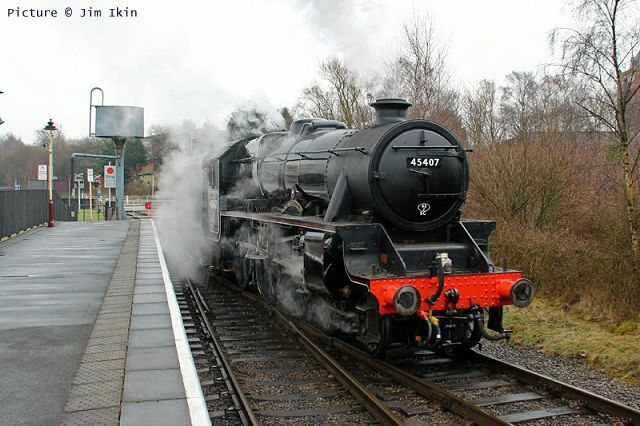 ... which made a superb departure from Bury piloting 45407. 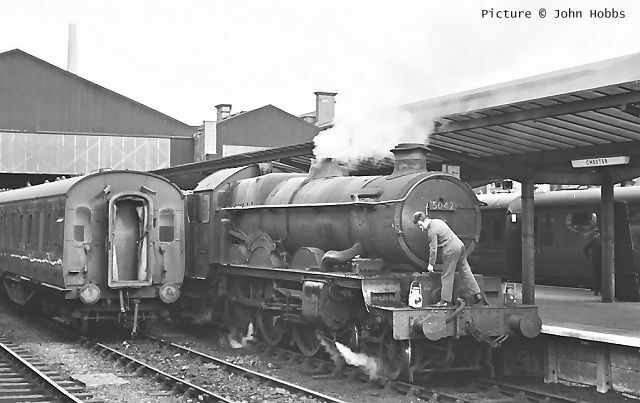 1896 Horwich-built Aspinall 52322 withdrawn from Oldham in 1960. Up the motorway from Llangollen last weekend was 48624 at Ramsbottom. 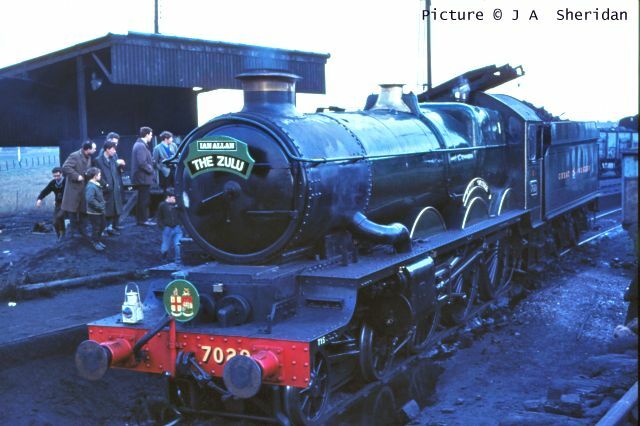 Also at Ramsbottom was 76084 (withdrawn from Springs Branch in 1967). 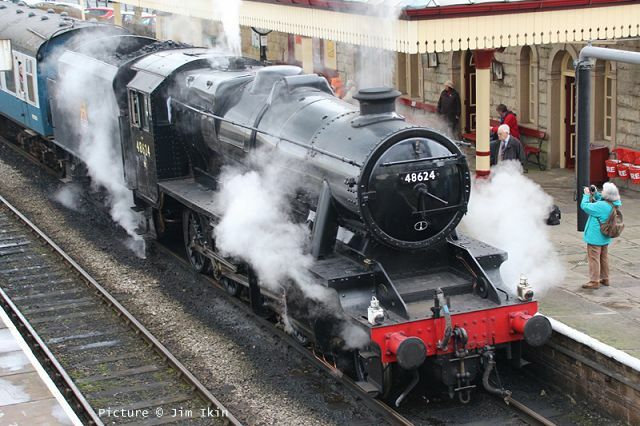 34092 City of Wells runs around its train at Rawtenstall.